The Kindertot programs at our dance studio include once-a-month themed dance lessons, session classes, half-year, and full-year programs. Geared towards the energetic first-time dancer, these dance classes are for students between the ages of 2 ½ and 8. These classes introduce our young dancers to our studio, imagination, creativity, free movement, technical training, and most importantly, fun! For more information, contact our Airdrie dance studio at admin@stardancecompany.com and visit us on Instagram at sbdc_kinder_tots. This dance class involves creative movement, imagination, socialization, ballet, jazz, and acro. Students learn through games and play and explore the world of dance. This class is a ½ hour each week. These students do not participate in the year-end recital but rather have a “finale day” held at the dance studio when the season is over. These dance lessons are a combination class where student learn ballet, jazz, and acrobatics throughout the season. Students learn through play and imagination but begin to be exposed to more structure in their dance training. This class is 45 minutes each week. These students do participate in the year-end recital held at the dance studio. These dance lessons are a combination of both ballet and jazz. Students learn both styles of dance throughout the season and end the year with the recital performing a ballet dance. This class is 45 minutes once a week. This class is a combination of both jazz and acro. Students learn both styles of dance throughout the season and end the year with the recital performing an acro dance. This class is 45 minutes once a week at our dance studio in Airdrie. These dance lessons are a combination of both jazz and hip-hop. Students learn both styles of dance throughout the season and end the year with the recital performing a hip-hop dance. This class is 45 minutes once a week. This class is a combination of both ballet and tap. Students learn both styles of dance throughout the season and end the year with the recital performing a tap dance. This class is 45 minutes once a week at our dance studio in Airdrie. We offer some of our Kindertot classes in a ten-week session format. Our first-semester session runs from September to December and our second-semester session runs from February to April. Ten-week sessions are a great way for students to try our dance lessons in different genres and see if dance is an activity they might be interested in! For more information on current and upcoming session classes at our dance studio, please see our schedule page. This is a great program where students between the ages of 5 and 10 can drop into the dance studio once a month and try a themed dance lesson, exert some energy, have some fun, and make new friends. These classes are generally themed towards corresponding holidays but include classes like “Haunted Hip Hop” and “Jumping Jelly Beans”. The class is an hour-and-a-half and is treated like a special event! Kids enjoy learning from our qualified SBDC staff but also participate in games, crafts, snacks and more. For more information on current and upcoming session classes, please see our schedule page. We realize that the start of the year can be a hectic time for parents and that often it is not until later in the season that some families are ready to commit to extracurricular activities. At SBDC, we offer half-year programs that start in mid-January and run until June where students still get to participate in our year-end recital. Recital costumes and tights are included in the cost of these classes so parents need only purchase the shoes and a weekly practice outfit. For more information on current and upcoming session dance lessons and classes, please see our schedule page. 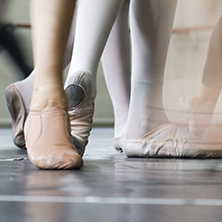 We offer recreational, non-exam, examination, and competitive ballet programs at our dance studio, all training under the Royal Academy of Dance (RAD) syllabus. We run recreational ballet programs for students ages 8 and above once a week for 45-minutes. Students learn from the RAD syllabus but are not restricted by preparation for exams. These classes are an introduction to ballet. These students perform in the year-end recital. Non-exam ballet dance lesson students train in the RAD syllabus but are not restricted by preparation for exams. Students at a junior non-exam level train for 45-minutes once a week. Students in our intermediate non-exam level train for one hour once a week. These students compete in two competitions and perform in our year-end recital. Examination students train in the RAD program in preparation to take exams. This program runs from a Pre-Primary-Advanced Level and is a graded program. Students must examine to move to the next level through the program and do so by recommendation from our Ballet Director, Miss Karen. Pre-Primary students also perform in our year-end recital. Grade 1 and Grade 2 students learn a dance for competition during their dance lesson time and perform in two competitions locally. Grade 3 Ballet Levels and above are considered technique only and do not perform in recital or competition. They are training classes for technique. At a Grade 3 Examination level, students are pulled into separate “choreography classes” where they prepare competitive routines. Students at this level will compete in 3-4 competitions seasonally. Members of the Travel Team will potentially compete in one competition that is non-local. We offer recreational, non-exam, examination, and competitive jazz programs and dance lessons at our dance studio in Airdrie, all training under the Associated Dance Arts for Professional Teachers (ADAPT) Syllabus. We run recreational jazz programs for students ages 8 and above once a week for 45-minutes. Students learn from the ADAPT syllabus but are not restricted by preparation for exams. These dance lessons are an introduction to jazz. These students perform in the year-end recital. Non-exam Jazz students train in the ADAPT syllabus but are not restricted by preparation for exams. Students at a junior non-exam level train for 45 minutes once a week. Students in our intermediate non-exam level train for one hour once a week. These students compete in two competitions as well as perform in our year-end recital. Examination students train in the ADAPT program in preparation to take exams. This program runs from a Primary-Advanced Level and is a graded program. Students must examine to move to the next level through the program and do so by recommendation from our Jazz Director, Miss Kristen. Primary, Junior 1 and Junior 2 students learn a dance for competition during their class time and perform in two competitions locally. Junior 3 Jazz Levels and above are considered technique only and do not perform in recital or competition. They are training classes for technique. Students at a Junior 2 Level must also be enrolled in a ballet technique class. At a Junior 3 Examination level, students are pulled into separate “choreography classes” where they prepare competition routines. Students at this level will compete in 3-4 competitions seasonally. Members of the Travel Team will potentially compete in one competition that is non-local. Turns, Kicks, and Leaps class is for students of a Junior 3 technical level or above. These dance lessons are geared specifically for training higher level transitions and tricks for competition in the genre of jazz. We offer recreational, examination, and competitive tap programs at our dance studio, all training under the Associated Dance Arts for Professional Teachers (ADAPT) Syllabus. We run recreational tap programs for students ages 8 and above once a week for 45-minutes. Students learn from the ADAPT syllabus but are not restricted by preparation for exams. These classes are an introduction to tap. These students perform in the year-end recital. Examination students train in the ADAPT program in preparation to take exams. This program runs from a Primary-Advanced Level and is a graded program. Students must examine to move to the next level through the program and do so by recommendation from our Tap Director, Miss Kristen. Primary, Junior 1 and Junior 2 students learn a dance for competition during their class time and perform in two competitions locally. Junior 3 Tap Levels and above are considered technique only and do not perform in recital or competition. They are training classes for technique. Students at a Junior 2 Level must also be enrolled in a ballet technique class. At a Junior 3 Examination level, students are pulled into separate “choreography classes” where they prepare competition routines. Students at this level will compete in 3-4 competitions seasonally. Members of the Travel Team will potentially compete in one competition that is nonlocal. We offer recreational, examination, and competitive acro programs at our dance studio in Airdrie, all training under the Acrobatic Arts or Acrobatique Syllabuses. We run recreational acro programs for students ages 8 and above once a week for 45 minutes. Students learn from certified and experienced instructors but are not restricted by preparation for exams. These classes are an introduction to Acro. These students perform in the year-end recital. Examination students train in the Acrobatic Arts or Acrobatique programs in preparation to take exams. These are graded programs. Students must examine to move to the next level through the program and do so by recommendations from our certified acro instructors. Primary and Level 1 students perform in our year-end recital. Students in a Level 2 training program or above, who are also registered in a ballet technique class may be pulled into separate competitive training choreography classes. These students will compete in 2-4 competitions at the Director’s discretion. Members of the Travel Team will potentially compete in one competition that is nonlocal. We offer recreational and competitive hip-hop programs at our dance studio in Airdrie. We run recreational hip-hop programs for students ages 8 and above once a week for 45-minutes. Students learn from experienced instructors who are active in the industry. These dance lessons are an introduction to Hip Hip but involve basic instruction in jazz dance as well. These students perform in the year-end recital. Students may participate in competitive hip-hop by recommendation only. Students are “pulled” into choreography classes and grouped together specifically to train for competition. Students will compete in 2-4 competitions. Members of the Travel Team will potentially compete in one competition that is nonlocal. We offer recreational and competitive musical theatre programs at our dance studio in Airdrie. We run recreational musical theatre programs for students ages 8 and above once a week for 45-minutes. Students learn from experienced instructors who are active in the industry. These classes are an introduction to Musical Theatre but involve basic instruction in jazz and ballet dance as well. These students perform in the year-end recital. Students may participate in competitive musical theatre by recommendation only. Students are “pulled” into choreography classes and grouped together specifically to train for competition. Students will compete in 2-4 competitions. Members of the Travel Team will potentially compete in one competition that is nonlocal. We offer non-exam and Competitive Lyrical Programs at our studio. Students in these programs must also be enrolled in a ballet technique class and must be recommended into this genre. These classes are solely to prepare competition numbers. Students will compete in 2-4 competitions at the Director’s discretion. Members of the Travel Team will potentially compete in one competition that is non-local. Students who are “pulled” for lyrical choreography must also be enrolled in a ballet technique class. We offer a number of Adult Classes at our dance studio in a session format. Adult dance lessons run for ten-week increments. These classes are great to introduce our non-experienced adult dancers to different genres offered at our dance studio as well as work on fitness in a fun, social, and energetic atmosphere. These dance lessons are taught by our experienced and certified staff. Our first-semester session runs from September to December and our second-semester session runs from February to April. For a list of adult classes being offered, at SBDC this season please see our schedule page.